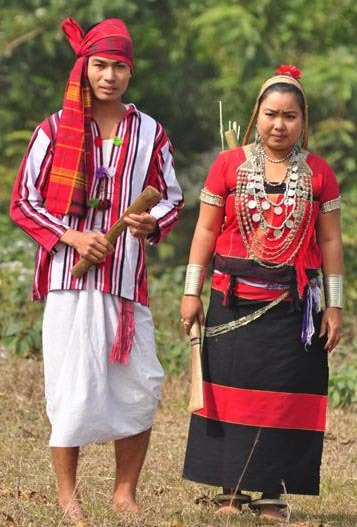 Noatias are one of the important tribal groups in Tripura. Though Noatias are a part of Tripuris, they are treated as ‘New Comers’. In fact Noatias were at Arakan Hill Tracts for a long time before they migrated to the southern part of Tripura via Chittagong Hill Tracts. Ethnically Noatias have similar origin as other Mongoloid tribes and their language is also Kok-Borok. It is said that Noatias is not their actual tribe name, they were actually Tripuris. Legend says that once a furious war took place between the then Tripura king and Arakan king. In that battle Arakan king took lead and captured hundreds of Tripuri soldiers. These Tripuri soldiers had to stay at Arakan. During their stay at Arakan they had contact and interaction with the local tribals and as a result their language and culture developed changes to some extent. Even today in the life and culture of Noatias influence of their old culture are still found in the form of their physical structure, skin colour, food habit, language, rites and rituals. As per 2011 Census their population is 14,298. Noatias have 11(eleven) major clans. These clans are Anokia, Khaklu, Totaram, Murasing, Noatia, Deildak, Keowa, Garjan, Tongbai Kalicha and Aslong. Noatias are Hindus and observe all pujas and festivals as per their tradition and customs. Vaishnavism has great influence over the Noatias. They also observe Garia and Baisu festivals like other Kok-Borok speaking tribes.